1. IC tag fixed on front frame of bicycle is read automatically by the sensor in front of the Entrance Door, and then the Front Wheel Shutter opens automatically. Then, the front wheel should be placed into the open space. 2. After the front wheel is fixed by the Clamp, step away from the mat and then press “the Loading Button”. 3. 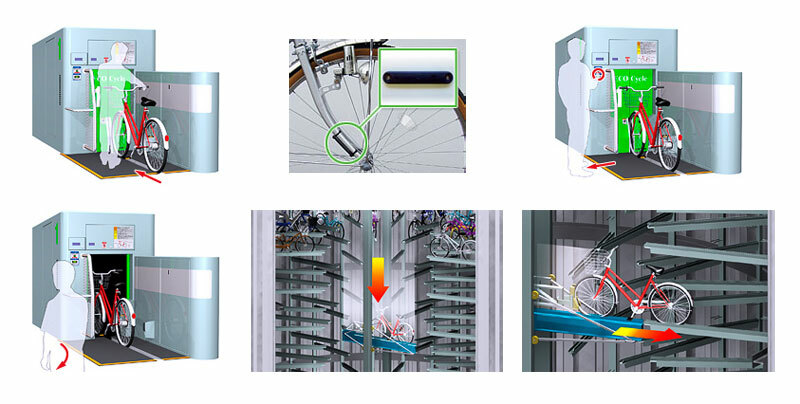 The Entrance Door opens automatically and then the bicycle is conveyed into the Eco-cycle. The door closes automatically. It is the end of loading operation. 4. Transporting Tray brings the bicycle down with revolving action to a vacant pallet. 5. The Transporting Tray slides to place the bicycle at the vacant pallet. It is the end of loading bicycle.